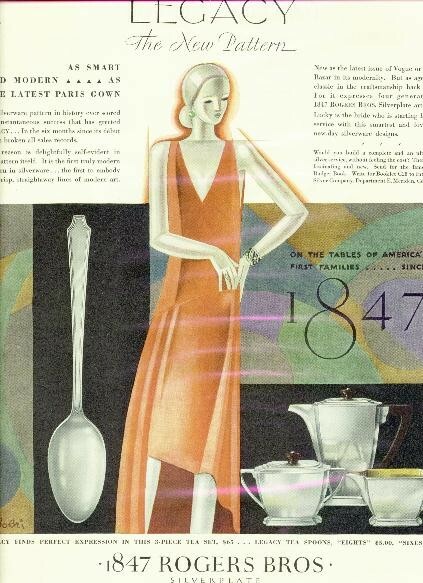 Silverplate advertisements of the 1920s and 30s used art deco styles to convey a stylish, modern image. The large (11″ x 14″) magazine formats of the day provided space for creative layouts. Unfortunately my scanner truncates some of the images. For more examples of advertising from the period, visit the advertising sets at my Flickr site. 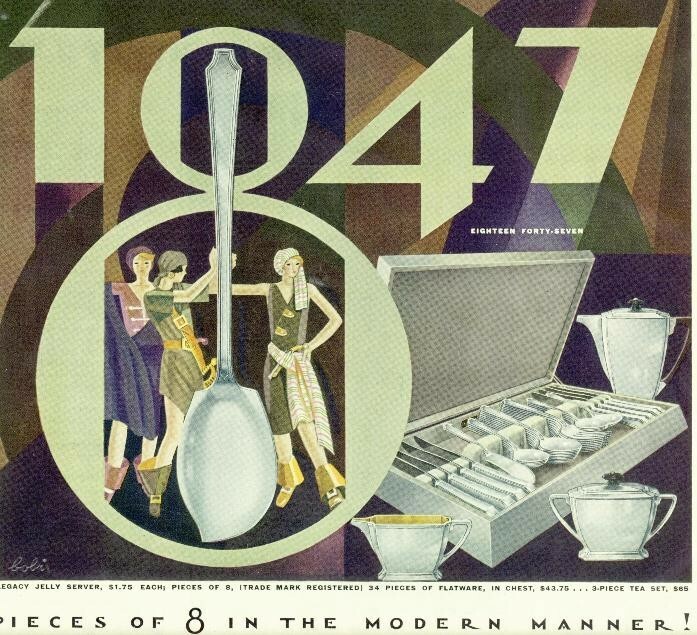 The problem in silverplate ads is to create a composition where the flatware is large in relation to the figures in the ad. Below, the artist has shrunk the girls for a whimsical effect. 1929. A Collector tells me the illustrator was Vladimir Bobritski, also known as Bobri. 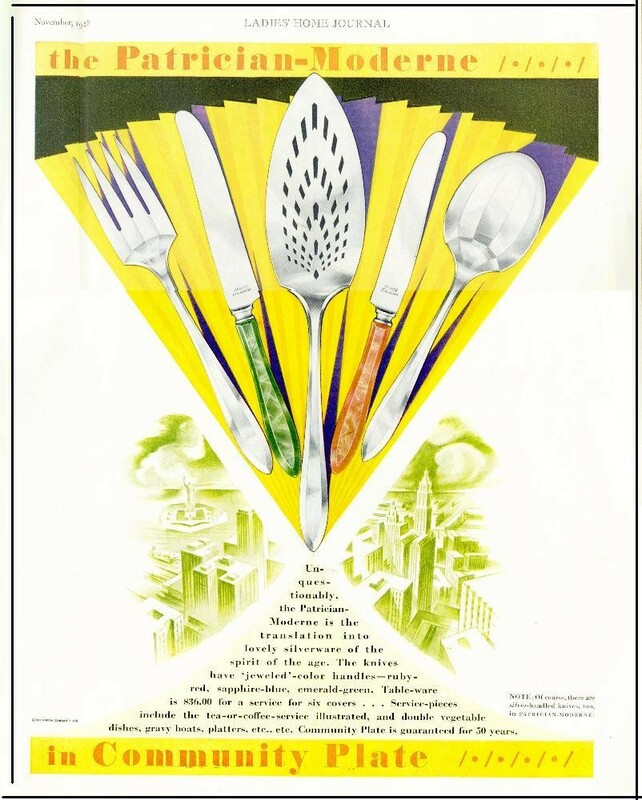 This flatware pattern (Legacy) is quite plain — dull even — but in the ad below, who notices! 1929. A Collector tells me the illustrator was Vladimir Bobritski, also known as Bobri. Here is another example of a plain pattern (Patrician) enhanced by a dramatic layout. All this without even a pretty girl to help out. 1928. 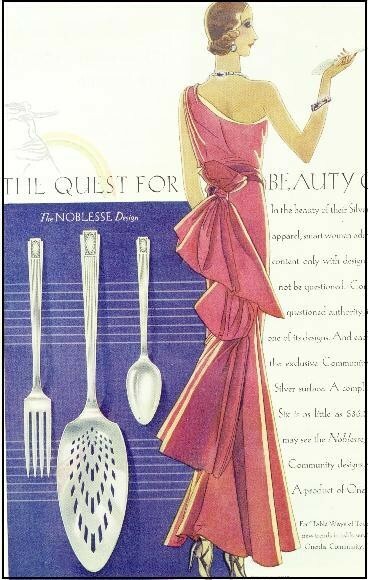 In this ad we have all the elements: beautiful, stylish woman, large flatware pieces, dramatic layout. 1931.